Caffenu’s in store free standing display unit does it all! 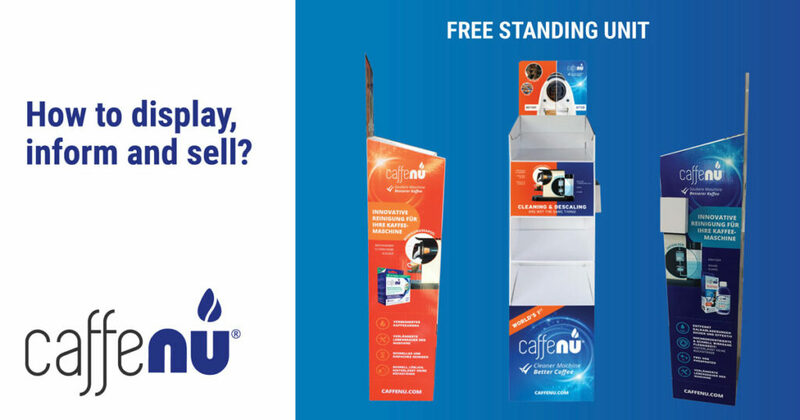 Caffenu® is conquering the retail market with our new free standing display unit. The unit is strategically placed next to coffee machines, and coffee capsules, so the right customer notices our cleaning products. The coffee machine graphic on the display gets the coffee shoppers attention. Once the shopper starts reading, they notice the before and after graphic on top of the display which explains the need for our cleaners. The unit also educates them about the difference between cleaning and descaling which is a crucial selling point. The bottom part of the display unit summarizes the foundation for Caffenu’s success: cleaner machine, better coffee! This free standing unit does not only display our products in a very professional manner. It draws attention to them, informs the customers and surely helps sell the world’s number one product in cleaning coffee capsule machines. Order yours today to grow your sales in retail and showroom environments.